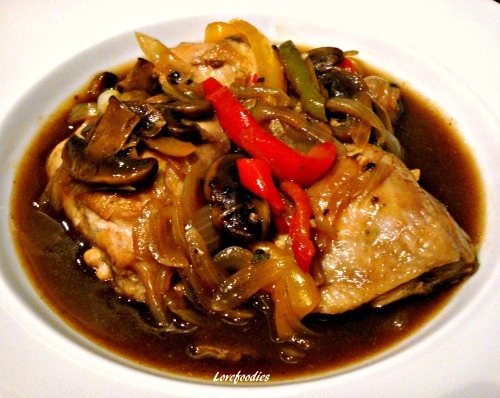 Easy Chicken in White Wine. The flavours are out of this world, and I’m sure you will like it! Categories: Main meals, recipes | Tags: chicken, Cooking, easy, how to make, ingredients, lovefoodies, recipes, sauce, white wine | Permalink. Frikadeller Meat Patties With Sauce – A wonderful meal, great served with your favorite pasta, rice or cous cous! Categories: Main meals, recipes | Tags: cream, Danish, dinner, Frikadeller, ground meat, how to make, ingredients, lovefoodies, main, recipes, sauce | Permalink. I often get asked ‘How To Make a Cheese Sauce’. So I decided to make a mini tutorial for you! and there’s NO lumps in my sauce! You can also swap the cheese for mushrooms, herbs, shrimps etc. Use this as your ‘basic’ recipe and make your own flavours. A keeper I would say! Categories: "How To" Tutorials, Main meals, recipes, Sides | Tags: bake, cauliflower, cheese, Cooking, cream, dinner, easy, food, how to, ingredients, lovefoodies, recipes, sauce | Permalink. These are a super tasting muffin using Cranberry sauce! Incredibly amazing and very addictive! Categories: Cakes, Desserts, recipes | Tags: baking, cake, Cooking, cranberry, dessert, food, how to make, ingredients, juice, lemon, lovefoodies, muffins, oven, recipes, sauce, sweet, zest | Permalink. No doubt we’ve all heard of the ‘double dip recession’, or is it now the ‘triple dip recession’? Then there’s Obama’s ‘fiscal cliff’…….not to mention the troubles in Greece and Spain. The list of countries continues to lengthen. Teenagers in twenty years time will be reading their history books wondering if they are studying something to do with theme park descriptions. They won’t know any different, and their parents will say ‘you don’t know how lucky you are’, because by then, we all hope the financial crisis will have long gone. Gone are the days when we could stroll down the supermarket aisle and decide to have a sirloin steak on a Wednesday, or throw away any ‘leftovers’ without even a thought to the wastage. These days, for most, a sirloin steak is reserved for a special occasion, and feelings of guilt attack us if we throw away left overs. Everyone’s looking for ways to save, whether it’s on fuel costs, energy bills or food choices. Even the supermarkets recognise shoppers are more mindful of their bank accounts. You only have to look at the huge variety of ‘budget’ or ‘value’ brands on their shelves. The question is, can we make a meal or two go a long way? If we choose ‘cheaper’ ingredients, or supermarket ‘own brands’, will the quality be any less than if we chose premium ingredients? Well, that’s for you to decide, but for me, there are ways you can make a tasteless tomato come to life. I’ve written a recipe for a basic tomato sauce, using fresh ingredients, all of which are inexpensive. The beauty of this sauce is you can make it in bulk, store in the fridge for a few days, or freeze it in portions. It’s up to your imagination as to what you’d like to use the sauce for. The sky’s the limit! I’ve used it combined with pasta, gnocchi, as a base for Spaghetti Bolognese, with chicken in a tomato type stroganoff, the possibilities are endless! 2. 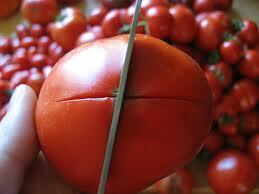 Using the tip of a sharp knife, cut a cross through the tomato skin at their bases. 3. Place tomatoes in a deep bowl and pour the boiling water over the tomatoes until they are all submerged. Leave until the skins start to peel away. 4. Drain the hot water from the tomatoes and peel the skin away. The skin should come off easily. If not, pop in the microwave for 30 seconds or add some more boiling water. Cut the tomatoes length ways and remove the white pith and the top where the stalk would have been. 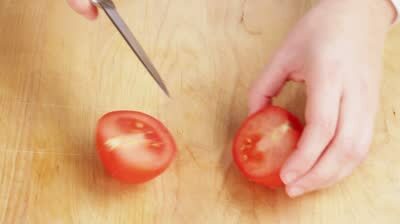 Chop the tomatoes into 1cm pieces. 6. Clean and chop mushroom into quarters or smaller. 7. Heat the olive oil in a saucepan. Add the mushrooms if you are using them. Cook them until they turn brown. Add the chopped onions and stir on a low heat. Cook until the onions turn translucent in colour. Be careful not to let them go brown as this will make the sauce taste bitter. 8. Once the onions have changed to translucent, add the garlic, chopped tomatoes, and tomato puree. Add the hot water. Give it a stir so everything is combined well. 9. Add the sugar, twist of salt & pepper and leave to simmer for 10 minutes on a low heat. 10. The sauce should have reduced and thickened a little. If you want the sauce to be thicker, simmer for a bit longer. If the sauce is too thick, add some more hot water. 11. Once ready, turn the heat off and tear a few basil leaves up and mix into the sauce. Taste again incase it needs more salt & pepper. The sauce can then be transferred into a bowl to cool down, and once cool, it will keep in an airtight container in the fridge for a few days, or you can freeze it in portions. I like to put the cooled down sauce into those ziplock type bags and put in the freezer as they take up less space. When you want to reheat the sauce, just before serving, add a few fresh basil leaves and you will be surprised at how fresh the sauce will smell and taste! If you want to spice the sauce up a little you can add a few drops of Tabasco sauce, or Worcestershire sauce. Season chicken lightly with salt and pepper. Lightly whisk 1 egg white in a bowl. Add the chicken pieces so the egg white is mixed well into the chicken. On a medium heat, place the chicken strips in a pan with a touch of hot oil and lightly fry until brown. 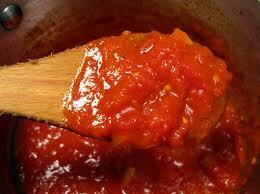 Add to the hot tomato sauce and leave to simmer gently for 5-7 minutes. (check the chicken is cooked by breaking a piece in half) . Turn off heat and break a few fresh basil leaves into the sauce. Serve with some pasta or rice. The egg white is used to give the chicken a ‘velvety’ texture and stop it from drying out. particularly when using chicken breast. Categories: recipes | Tags: basil, bolognese, different tomato recipes, sauce, tomato, tomato and basil sauce, Versatile tomato sauce | Permalink.